President Trump confronted NATO chief Jens Stoltenberg Wednesday over the energy agreements several European countries have with Russia. The president wanted to know why the U.S. was continuing to pay money to the group when some countries in the alliance are buying energy from Moscow. "You know, NATO is an alliance of 29 nations, and there are sometimes differences and different views, and also some disagreements. And the gas pipeline from Russia to Germany is one issue where allies disagree," Stoltenberg said. "But the strength of NATO is that despite these differences, we have always been able to unite around our core task, to protect and defend each other, because we understand that we are stronger together than apart," he added. But that didn’t satisfy Trump. “But how can you be together when you’re getting energy from the group you want protection from?” he asked. The president pointed to Germany as an example and said the country was “totally controlled” by and “captive to Russia” over the Nord Stream 2 pipeline project, which would “double the amount of gas Russia can send directly to Germany, skirting transit countries such as Ukraine,” FoxNews.com reports. "So we're supposed to protect you against Russia but they're paying billions of dollars to Russia and I think that's very in inappropriate," Trump said. "And the former Chancellor of Germany is the head of the pipeline company that is supplying the gas. Ultimately, Germany will have almost 70% of their country controlled by Russia with natural gas. So you tell me, is that appropriate? I've been complaining about this from the time I got in." 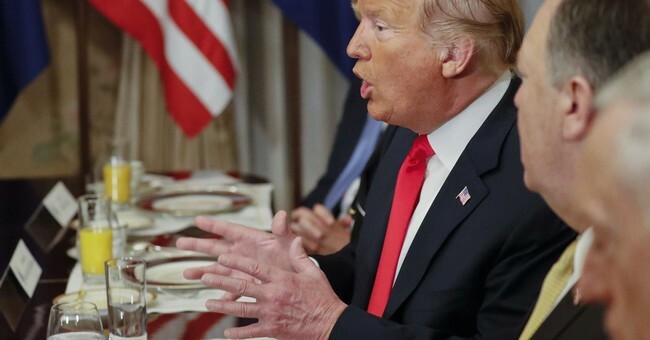 PRESIDENT DONALD TRUMP: I think it's very sad when Germany make as massive oil and gas deal with Russia when you're supposed to supposed to be guarding against Russia and Germany goes out and pays billions and billions of dollars a year to Russia. So we're protecting Germany, we're protecting France, we're protecting all of these countries and numerous countries go out and make a pipeline deal with Russia where they're paying billions into the coughers of Russia. So we're supposed to protect you against Russia but they're paying billions of dollars to Russia and I think that's very in inappropriate. And the former Chancellor of Germany is the head of the pipeline company that is supplying the gas. Ultimately, Germany will have almost 70% of their country controlled by Russia with natural gas. So you tell me, is that appropriate? I've been complaining about this from the time I got in. It should have never been allowed to happen. But Germany is totally controlled by Russia because they were getting from 60 to 70% of their energy from Russia in a new pipeline and you tell me if that is appropriate because I think it's not and I think it's a very bad thing for NATO. And I don't think it should have happened and I think we have to talk to Germany about that. On top of that Germany is just paying a little over 1%. Whereas the United States in actual numbers is paying 4.2% of a much larger GDP. So I think that's inappropriate also. We're protecting Germany, we're protecting France, we're protecting everybody and yet we're paying a lot of money to protect. Now, this has been going on for decades. This has been brought up by other presidents but other presidents never did anything about it because I don't think they understood or just didn't want to get involved. But I have to bring it up because I think it is very unfair to our country, it's very unfair to our taxpayers and I think that these countries have to step it up -- not over a 10 year period, they have to step it up immediately. Germany is a rich county. They talk about they can increase it a tiny bit by 2030. Well, they could increase it immediately tomorrow and have no problem. I don't think it is fair to the United States, so we're going to have to do something because we're not going to put up with it. We can't put up with it. And it's inappropriate.